Montréal was the second major stop on our French Canadian trip. We quickly learned that Montréal did not attract us as fast as Québec did. I usually do not mind urban driving, but Montréal proved itself to have some of the worst drivers of a city I have visited. Up there with New York, Atlanta, and Salt Lake City. It was a great moment to pull into the hotel and drop the car off, not to need it again until we had to leave. Montréal is the largest city in the Provence of Québec, and is an important economic hub for Canada. It is also the second largest Canadian city, right behind Toronto. Percentage-wise, the Anglophone community of Montréal is larger than Québec. It lies on an island where the St. Lawrence and Ottawa rivers meet, roughly a little more than 150 miles from Québec. After we arrived, we turned our car over the valet, and headed for dinner at Peel Pub, caught a movie, and turned in. Waking up this day proved to be a bit more difficult. After days of moving on and on, exhaustion finally caught up to us. So we ended up sleeping in a bit. When we finally got up for our day, we headed towards the mountain in the heart of the city that gave the city its name: Mont Royal (in English, Mount Royal). We spent all morning hiking this mountain. We did not take the direct pathway towards the summit, but taking the switchback pathways. While we were there, I thought that it had a Central Park "feel," only to find out that the designer of the Mount Royal park was the same designer of Central Park. We stopped for lunch at a café. After lunch, we continued our hike, and ended at the famous Chalet du Mont-Royal. I was excited to find a piano found in the lookout, only to find that through use, it was well loved, but not as playable as I would have hoped. 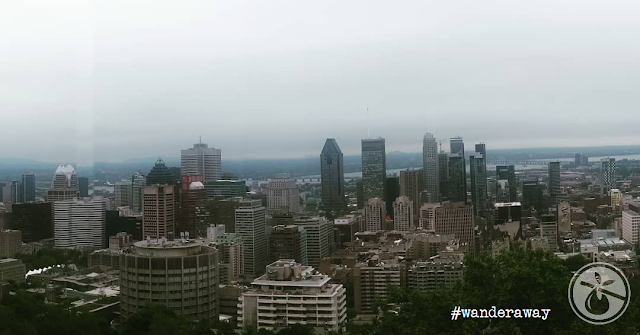 The views of Montréal from this lookout were stunning. We then made our descent and went back to our hotel, rested a moment, and headed towards Old Montréal to visit Notre-Dame Basilica of Montréal. Unfortunately, they had closed only 30 minutes before we got there, so we could not go inside. Oh well. Then Jordan read about a cool place to visit for the evening after dinner: Bootlegger l'authentique, a jazz bar that serves whiskey and classic cocktails. We love jazz, and love swing dancing, and I am a fan of whiskey, so we walked there. Again unfortunately, they are not open on Mondays, so we could not get in. So we took a quick rest at Mckibbins Irish Pub, then walked back to our hotel to decide on dinner. We chose 3 Brasseurs (3 Brewers in English) for dinner. We split a wonderful flammekueche, or tarte flambée, a flat bread topped with cheese and other toppings, similar to a flat pizza, and paired it with an amber ale. We were seated at a corner table, and it was a busy intersection, so it was a great time to people watch. 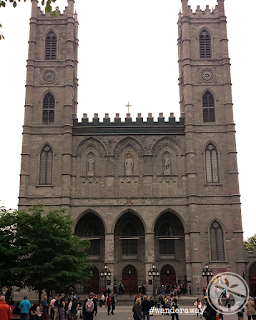 While not as enjoyable to us as Québec was, we still enjoyed Montréal and want to come back. One day is simply not enough time to explore what Montréal has to offer. So when we come back, it would be more than 1 or 2 full days. "Delta Hotels by Marriott Québec - A Review"
"Hotel Omni Mont-Royal - A Review"